Story added: 24 Apr 2006 21:09. Last updated: 29 Aug 2006 22:24. Sony Ericsson's core music mobile promises lots, and unlike an Embrace album, it delivers. The range of Walkman mobiles now stretches further than our incredulity over the fact that Coldplay are a successful recording act. And slap bang in the middle of that line up resides the W810i, which offers an enticing blend of high-end features in a relatively affordable package. Taking its design cues from previous star performers such as the K750i, the W810i is a vision in matt black. Its compact lines set off by a rather novel soft key and joystick one-two-three combo sitting below an exceptionally clear 262k colour screen. Things are also good round the back, with a 2 megapixel camera playing into the hands of people that like pictures as well as movies. In use it's a dream, as long as you like the Sony Ericsson menu system, anyway. It's easy to navigate your way around, make calls and sort your diary, and the important job of accessing your music is also simple - just press the orange key on the front and you are away. Your tunes are stored on a 512MB Memory Stick that comes in the box, and while this is reasonable and can be added to with extra cards, this isn't now that amazing an offer compared to other handsets from Nokia, Samsung and even Sony Ericsson, as manufacturers keep up the pressure for us to listen to music on our phones. 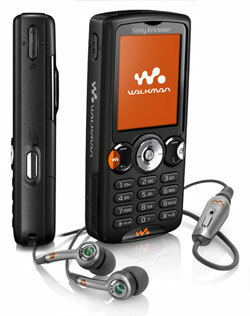 As with all the Walkman phones, Sony Ericsson has done well to make sure they sound the business, and the supplied in-ear headphones provide just enough oomph for the tune. Also, as they split in two, you can also upgrade or replace them if you wish. So all's well and good in the state of Walkman. And thanks to is great call quality and impressive battery life, we predict that this handset will go far! Seeing as you can pick this baby up for free on some accounts, we can't think of a real reason why not to let it play the soundtrack to your life.